It has become a standard part of every organization’s marketing plan to have a database of customer emails. Millions of companies and institutions are sending out email newsletters, promotions and solicitations everyday, both for consumers and the trade. You’re probably receiving many of them yourself and if you’re anything like me, you probably delete all but a few as soon as you see them land in your email box. More often than not, these are emails from companies you know or may even have requested information from. The others end up in your junk folder. About 20% of these emails get opened but a much lower number are actually read — click through rates are about 5%. Another way of saying that is 80% of these emails are never opened and 95% are never read. When you think of it that way, you have to ask how you can improve? 1. Have a database strategy. Think of it this way: Would you advertise without an objective, creative strategy and message? Database marketing is no different. What do you want your database to do for you? Who do you want to reach? What do you know about them that tells you what they want to hear from you? Do they all want to hear the same thing or should you segment them by interest or need and address them accordingly? Think these things through and write a strategy that keeps your database use focused, disciplined and integrates it with your other marketing programs. Otherwise, say hello to junk folders. 2. Think of your database as a community. If you think about databases as numbers of files and demographic fields, you’re working with an outdated framework. Imagine that you’re the mayor of a town and each member of your database is a resident. They live in separate areas that may have demographic and psychographic markers but more importantly, they have different needs. Some areas may want better schools, some more security or different zoning. Databases are no different. They can be grouped by needs and then you can address your database members with just the information that they’re looking for. You can build your database more quickly by buying names from list brokers. You also can alienate a lot of potential customers and get labeled as spam. It’s better to build one by one, if necessary, even if you’re starting at zero. There are a number of techniques that can raise awareness of your company and you’ll add prospective customers who actually are interested in learning more. For one of our clients, we began at zero several years ago and now have 8,000 members of their trade and nearly 100,000 loyal consumers signed up. Click-through and open rates are higher than industry averages and unsubscribes are lower. The reason is that people want to be there. Perhaps the biggest mistake companies make with the information they send to their database members is that they send the same information to everyone. That’s a fast way to increasing the number of unsubscribes. People want information that pertains to their needs. Email is similar to advertising in that you have only a few seconds to attract the reader’s attention. It’s a quick trip to the delete key. A singular approach, whether in e-newsletters, promotions or other announcements will speak to only one group. Over the years, the amount of competition and market clutter has fragmented both trade and consumer markets. You can think of it like cable TV. We now have access to more than 1,000 channels with most focused on a specific area of programming to meet specific viewer needs (history, cooking, discovery, shopping, etc.) When programming doesn’t address needs, people change the channel…or they hit the delete key. 5. If you can only know one thing about your customers, know their frustrations. A frustration is simply an unmet need. If you can fulfill unmet needs, you’ll have a customer. How do you learn what frustrates people about your product? Ask. Your first email to a prospective database member should be to ask questions about their frustrations and needs. There are some easy ways to use either closed- or open-ended questions to do this. Once you understand unmet needs, you’ll see that people can be moved into needs-based segments. You’ll also learn that many of the demographic and psychographic markers you used to use are really not an accurate guide to predicting what customers and non-customers want to know. 6. Your job is to listen, not tell. 7. Tell them what you heard. Whether trade or consumer, the first question people ask is “What do other people like me think?” B2B customers want to know how their peers are dealing with the same issues they have. Consumers want to know how others, just like them, solved the same problems or used certain products. This is why early chat rooms were immediately successful and led to the growth of social media. After you ask your customers about their needs, report back to them on what you learned. This says that you listened to them and that you have an understanding of who they are, how they are distinct and what they share with others like them. It pays off. This is the payoff. Build by asking, then listen, acknowledge and then ask again. Stop giving a monologue to your customers and build a dialogue with them. Do this enough and you’ll be able to get them to help you add qualified people to your database through friends and family or associates programs, join advisory boards or participate in regular feedback panels. Over time, you can turn them into your brand ambassadors and expand your marketing reach. Isn’t this the real goal of marketing? 9. Facebook likes are not a customer database. Social media has its uses. It’s a like a TV channel that goes out to the masses. It can be great for raising awareness but it does not acquire an audience that you can always reach nor does it help you segment customer needs. Social media is like shooting a shotgun and hoping you’ll hit your target. They’re out there but you don’t know where they are nor when they’re paying attention to you. Database marketing is a completely different marketing tactic and one is not a substitution for the other. 10. Using successive emails to qualify people. Many companies capture emails from people who visit their websites. Then they begin a series of successive emails and key future marketing based on which email garners a response. However, it doesn’t work that way because customers don’t give you that many chances. Keep in mind the environment in which your email is one of dozens or even hundreds your customers or prospects receive each day. Your first email has to give them a reason to respond. Draw them into a dialogue and then you can qualify them along the way. Follow these ten tips and you’ll improve the performance of your database. More importantly, you’ll get closer to your customers and create relationships that generate sales and referrals. While I’m advocating asking a lot of questions of your database members, note that I didn’t mention market research once. Market research will tell you what people think at a point in time and that information can be a good evaluative mechanism. But this is about having a conversation and using some digital tools to allow you to engage your customers in very large numbers. While we have our own proprietary tools for increasing customer involvement and loyalty, we can also help you do it on your own. The important point is to stop looking at database marketing as a linear process and see it as a relational part of your marketing program. Investment management firms always warn that “past performance does not necessarily predict future results.” It makes sense. Just because an investment manager has hit it big in the past doesn’t mean that he or she will know when the next big rise or fall in the market will come. 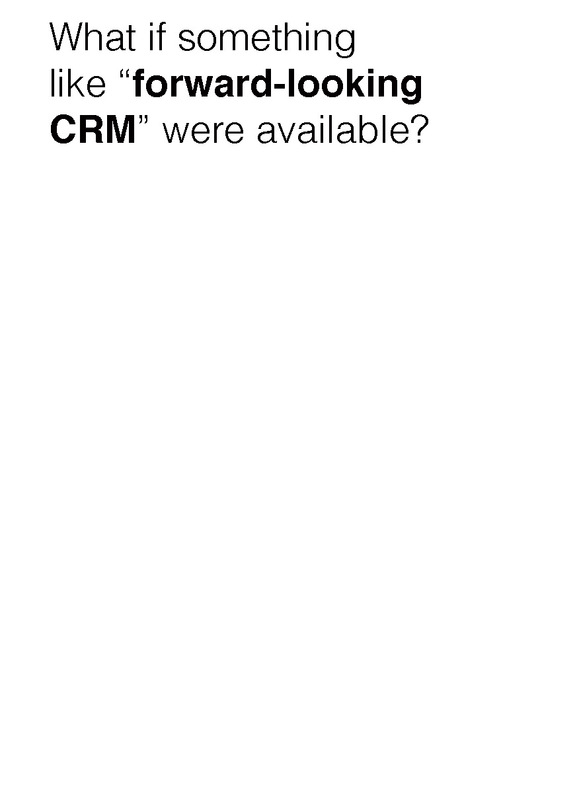 So why doesn’t that same caveat go with Customer Relationship Management (CRM) systems? Companies spend millions of dollars with companies like Oracle, SAP, Salesforce, Microsoft and many others (and what’s a small to medium size company to do when faced with the investment and difficult implementation?). These systems work off of customer “touchpoints” to make relationships and customer management easier. A “touchpoint” is any past interaction with a customer whether it is a sale where product purchase and customer demographics are acquired, a complaint, inquiry or field contact (assuming the field rep enters the information properly and accurately). Have you ever gotten upset that you can’t understand the foreign accented customer center rep when you call to ask a question about your bill? Some of us don’t care but others find it annoying. It’s because the company using the CRM system didn’t note that your call should be routed to a U.S. based call center and decided it’s cheaper to have your call go to someone they’re paying only several dollars a day, customer satisfaction be damned. CRM didn’t help there. Or do you get annoyed when political campaigns send you two or three fund raising requests a day while never asking about your beliefs? They use CRM too but the systems don’t gather your opinions and beliefs. They only note where you live, how you voted last time, whether you gave before and possibly what type of car you drive and magazines you read so they can create a profile they believe is predictive. How about coming home to find the post office has delivered four L.L.Bean catalogs? Waste of paper? Absolutely, but blame their CRM system for the confusion. Amazon is quite sure that because you bought a book about wine, you’ll absolutely want to purchase a new wine cooler they’re carrying. You may not have even noticed but their CRM system says you’re a prospect. Millions of customers, sales, inquiries, complaints equals billions of data points so inaccurate interpretations, solicitations, mail and email deliveries are bound to happen, right? Not necessarily. What if something like “forward-looking CRM” were available and affordable? Imagine if companies or politicians asked you what your needs and frustrations are and once they knew, could use that information to tailor responses to you and provide better products, services and build their overall customer relationships. Imagine politicians asking what his or her constituents believe – the massive Town Hall that Ross Perot used to rant about – and adjusting their positions to truly be representative of what voters are telling them. Sound impossible? Futureshift’s DirectLink™ system enables you to ask any group what they believe and why, what their needs are and why, and most importantly, what their frustrations are and why. You can ask in an open-ended way questions that begin with “why”, “what” and “tell us about” and people write like they’ve never been asked these questions before. Then, CALCAT™ software takes over and helps tag ideas and beliefs so that qualitative information can be shown quantitatively in bars and graphs just like people are used to. Below is an example of how DirectLink™ can reveal more about customers. The topic is wine but it could be any product or service. 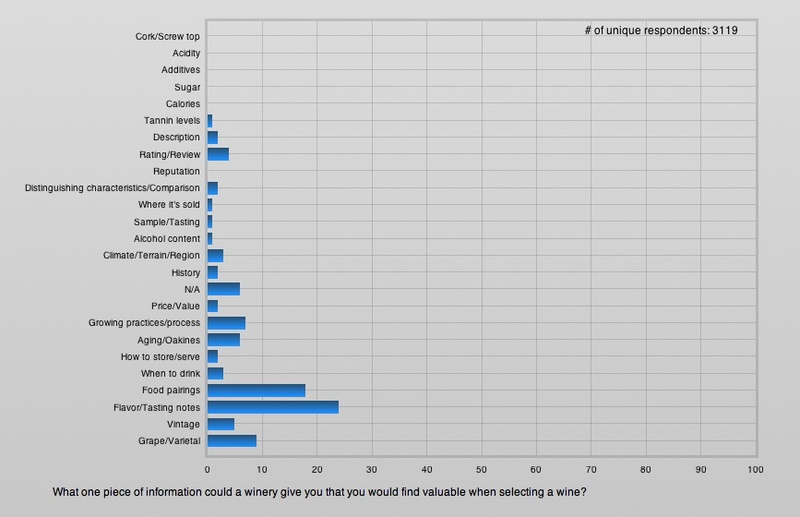 The question in the chart below (“What one piece of information could a winery give you that you would find valuable when selecting a wine?”) was answered by 3,119 people and you can see the array of responses. But now, let’s say you want to know more. How did people write about some of their answers because you might want to refine the way you give them information. So let’s say you select the response “Flavor/Tasting notes”. You can click that response and then one button, called “Get Verbatims”, which instantly shows a screen like below. Now, you can read how all of the respondents talked about “Flavor/Tasting notes” and you can see the descriptive language they use or even create word clouds so the most common terms stand out and then you’ll know what the customer’s lexicon is so you can know just what language to use to talk back to them. Now, it gets more interesting because you’ll want to talk back to them in a way that is specifically tailored to their needs. 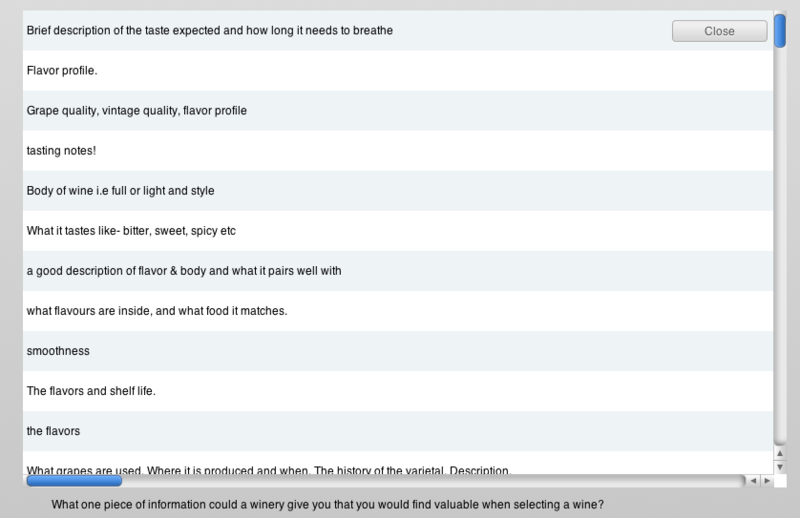 This group has indicated that they want better flavor and tasting notes from wine marketers. What if you have something to say to them about this? Is there a way you can reach them immediately? Easy! All you do is click the button at the side that says “Get Emails” and an email list of all the people who are looking for better flavor and tasting notes downloads to your computer, or for that matter, to your mobile device if you’re on the road. Now, you can email them something specific to their needs. This ease in immediate implementation makes it both practical and effective for small businesses to target market. Typically, with most products, marketers want to get more specific in regards to addressing consumer or customer beliefs. They might have three, four or five variables they want to combine together and this can take days to obtain multi-variable analysis, let alone find the people behind those beliefs. Not any more. Multi-variable analysis and grabbing the people in that specific multi-variable segment is now instantaneous and automatic. Above, four variables have been selected: (1) women; (2) age 50 – 59; (3) want Flavor/Tasting notes; and (4) prefer to get recommendations from the sommelier. Now, you can look at every question you’ve asked for that group or you can quickly download a list of email addresses for this refined segment so you can send them a message tailored to their needs. The result is a personalized response tailored to your customer’s needs. This creates more customer awareness, interest and loyalty because you’ve shown you’ve listened and are responsive, which is the point of CRM to begin with. Perhaps of more note, however, is how easy it is to operate the system yourself without a bevy of expensive consultants descending to your business and drowning you with minutiae. DirectLink™ can act as a “look-forward CRM” system for small to medium sized companies with databases of several hundred thousand. Groups can be defined by a series of responses to questions and messaging can be tailored to the language they use, beliefs they hold or frustrations they’re holding. In this way, marketing can address the current and future needs of consumers and customers and be truly predictive at a cost that makes it more approachable than those big CRM systems. With larger databases, DirectLink™ information can be appended to databases to make those systems “needs-based” and ultimately more effective. How is your Spanish? 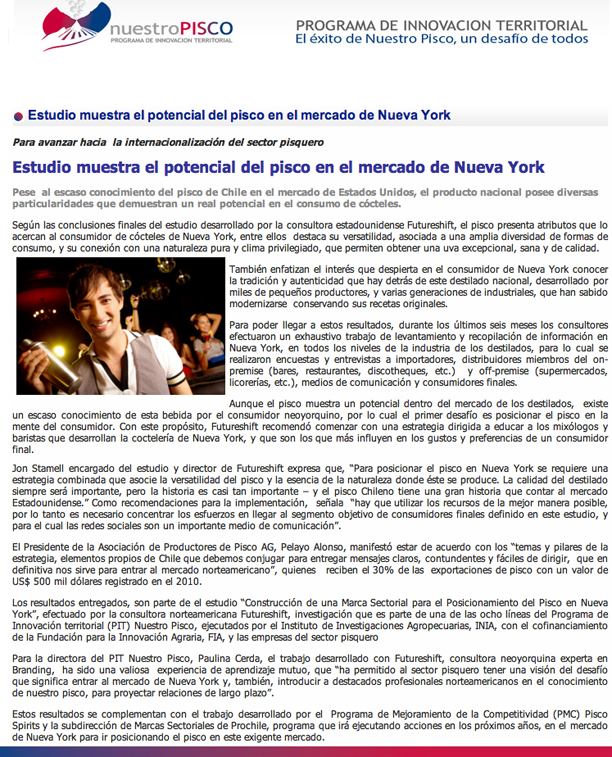 If it’s at reading comprehension level, you can read the article below about our recent work with the Pisco industry in Chile. Otherwise, you can go here and click on the English translation. In another week, we’ll be sending out our own report of our work in Chile. If you buy a bottle of Chilean Pisco, make a cocktail (as simple as Pisco, tonic, lemon or lime and a drop or two of bitters), it will be much more enjoyable. If you’re not already on our list to receive this report (meaning that you participated in a market research survey about Pisco), send in an email and we’ll make sure you receive the link as soon as it’s published. It will have some great information about the cocktail market. I’ve been holding onto this one since last month. I came across an article on Bnet.com, titled “Should we advertise on Glenn Beck?” by the CEO of Blinds.com an online store that sells all types of window blinds. You can read the story for yourself but in short, he thought a good place to find a demographic for his company’s products would be consumers who listen to Glenn Beck’s radio show. Within a week, he received a boatload of hate mail. In his words, “It took all of about 6 days before the vitriolic verbal attacks against me and my company rolled in via Twitter. And they’ve been nasty — I’ve been called everything from a Nazi and a homophobe to a slew of other names that if published here my editor would surely censor….One day last week, within 24 hours alone, I received hundreds, if not thousands, of tweets along these lines.” He went on to say that he never had any intention of endorsing Gleen Beck’s views. In fact, he said he never listened to the guy. All he was doing was looking for a demographic. I consult on these types of issues with a lot of clients that are foreign countries and their industries. As a large part of our business is foreign, I think it gives us some 30,000 foot level perspective on the U.S..
One thing I tell them, that you’ve discovered, is that Americans don’t just want value, they want values. It’s both a negative symptom of our political and media polarization and a positive manifestation of our increasing awareness of globalism and multi-culturalism. It’s not enough to buy an audience or demographic any more. You have to consider how your values and those you espouse through your company relate to or resonate with a marketing vehicle’s audience. Due to our extreme polarization, we have as many rabid against-anythings as we do pro-anythings and they will readily take action in opposition to the other. This is a tough needle to thread for any marketer. Personally, I probably wouldn’t buy from a company that advertised on Glenn Beck, although the only way I’d find out is from someone writing about it and the fact that they would and do tells you something about the environment we’re in right there. Professionally, I’d be unlikely to recommend it because I know and you now know what would ensue. There are so many ways to reach your target customers that are likely to be more effective, non-controversial and much more economical. While I want to impart some good advice to you, I’d also like to sell some of those ways too. You may get a hint of that from our website, but I can be more specific if you contact me through our website. Well, I got a form email response back. It was polite enough but no further dialogue ensued. That’s okay though because I thought it was the perfect example of what a treacherous marketing world we’re all in. It also tells us who’s really in control. We have to decide where we stand, not just in business but personally, define our values and then adhere to them in the way we conduct ourselves personally and through work. Otherwise, many of the people we’d like as customers, friends or associates will drop us like…well, as quickly as they can drop the blinds on their windows. Lately, I’ve been thinking about the lack of creativity in business. People are simply risk averse and don’t want to stick their necks out. Is it the economy? Our culture where you’re likely to be under attack for whatever view you espouse? Or simply the age old CYA corporate mentality? Tried and true seems to win out every time. Better safe than sorry, as they say. Advertising is but one example where creativity has declined. I’ve now begun to put the TV on mute when I see that National Car Rental ad come on knowing I’m about to hear, “just like you business pro, just like you.” I’m turned off by the Geico Gecko and if that once good actor, Michael McGlone, asks me one more time if it’s true that Geico could save me money, well…gag me with a spoon, as they say. I used to teach an advertising course at a local university. On the first night of class, I’d ask, “who saw, read or heard an ad today?” The students would look incredulously at me thinking that I don’t know anything and, of course, every arm went up. “But, what’s the product?” I would always ask. Two problems with advertising today: (1) the stories don’t connect to the product or brand strategy so we often remember the story but not the product; (2) they’re told to us over and over again, incessantly so that we do make a connection but end up hating the product. Oftentimes in print ads, particularly in trade publications, there’s no strategic message nor is there a story. For example, look through any trade publication for the alcoholic beverage business and you’ll find ads that show a bottle and make a statement like “Try the ultimate sipping rum.” One of my favorites is a wine ad with a photo of the bottle and the headline, “It starts with an idea.” Unfortunately, I couldn’t find one. Ad agencies use forms called “creative briefs” to avoid this problem because they force you to think in a way that makes a connection between the idea and the brand strategy. But many of these ads are produced by agencies, so something isn’t working. It’s why we pester our clients and their agencies to make a strategic connection in their ads. 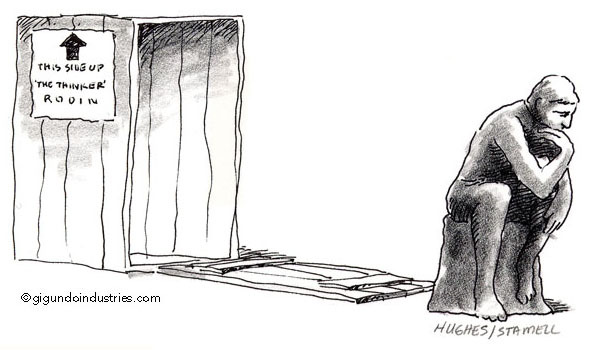 Yes, it’s important to get outside the box but if you’re trying to sell something, please connect the story to your strategy. Otherwise, don’t be surprised when prospective customers turn off the volume on their TV or their ears. Yes, it’s been a two month hiatus, wiped out by the holidays and start of the new year, but we’re back in force. Every so often, an article comes along that everyone should read. Whether you’re in business, a blogger, twitterer or just find yourself hanging out on the Internet, some authors writing for The McKinsey Quarterly have come up with one you shouldn’t pass up. I hesitate to tell you the title because I’m afraid it might it scare some of you off. But let’s plunge in and I’ll explain why it’s important. The article, “Clouds, big data, and smart assets: Ten tech-enabled business trends to watch” sounds both techie and ominous but it’s really neither. The article is particularly important if you’re in the information technology business, but the trends that the authors cite are effecting all of us in both the way we go to work and the way we live. It’s time to rethink your priorities, how you’re marketing, selling, or using technology to walk, run or keyboard your way through life. It speaks to the importance of web-based communities and their pervasiveness in our work and home lives. Yes, web-based communities can be about marketing to corporations and the latest episode of your favorite TV show to consumers, or the latest revolution abroad, but it also highlights the growth in co-creation and collaborative work and ideation that’s taking place. Organizations, corporations and countries are expanding in their depth and breadth through cross-boundary networked organizations. Small countries and corporations can rapidly become bigger than large ones by managing global knowledge and using communities to create, test and provide feedback. Scaling up is no longer limited by your own resources. Simply use those that belong to others but are waiting for you to stop by. Innovation and creativity now and increasingly in the future are coming from the bottom of the pyramid, not the top. I recently was interviewed by Kirk Laughlin of Nearshore Americas about nation branding with particular focus on Latin America. The interview can be seen here or at this link. The August 5th mine collapse near Copiapo, Chile seemed like more bad luck for a country already hit by one of the largest earthquakes in history this past February.Media coverage of the mining disaster was constant and the way in which the Chilean government and miners handled the situation mesmerized the media and consumers alike. On October 13th, millions across the globe were riveted to their TV sets watching the dramatic rescue take place, almost two months before anticipated. It was a stunningly inspirational scene – a disaster, rescue plan and successful result – seemingly in lockstep that even Hollywood writers couldn’t have improved upon. At the outset of the crisis, it was hard to imagine there could be a silver lining to the story, one that could provide an advantage for how Chile, as a country, is presented to the world. Can the outcome of natural or man-made disasters have a positive impact on a country’s competitiveness in growing exports, attracting investment or seeking outsourcing contracts? The Chilean miners’ rescue offers some interesting lessons. There is that old saying that “a fish rots from the head”. Conversely, positive, focused leadership trickles down throughout an organization and effects planning, implementation and results. Chile’s focused leadership from President Sebastian Piñera and particularly Mining Minister Laurence Golborne made a difference in how the rescue effort (managed more like a large construction project) was strategically planned and implemented. The plan allowed for international cooperation, options, customer relations (i.e. miners’ families), and management of public expectations. Chile offers a diverse mix in its socio-economic strata. Much of the country feels like a highly developed nation. There is a thriving middle class, high literacy and education rates, advanced use of the Internet and telecommunications. Yet, there are pockets of extreme poverty and underdevelopment that give a very different picture. It’s certainly a very long way from Haiti to Chile but Chile still is not at the level of many developed countries which probably explains why the country ranks #30 in the Global Economic Forum’s World Competitiveness Report and not higher. The Chileans didn’t ask for charitable contributions but did welcome cutting-edge technology and advice from other countries with the goals of beating the expected result of not getting the miners out until mid December. The U.S. has not responded in as focused or timely a way when it has been hit by disasters. American egos have gotten in the way of accepting foreign help. While the media savvy crisis mangers in Chile worked with the international journalist community, platitudes and wild claims were avoided and the focus was kept on what needed to be done. Then, on September 10th, an article appeared in Universal Knowledge@Wharton, the newsletter of the esteemed Wharton School of Business’, titled, “Lessons on Leadership and Teamwork – from 700 Meters Below the Earth’s Surface”. The article is an interview with Francisco Javier Garrido, a professor of strategy at various MBA programs in Europe and the Americas. Garrido talks glowingly of the miners and their leadership skills. These are the types of stories, not the ones about mistresses or movie deals, that will be long lasting and have true value for Chile’s image and competitiveness. Since the successful rescue, there have been hundreds of articles and blogs adding to the comments on work skills of the miners and leadership of Chilean officials. First, is it ethical to use the story of the miners to profile or position Chile or Chilean businesses? If used in a tactical way, it seems inappropriate and opportunistic to promote such a story as saying something positive about a company, sector or country. To those who read the media coverage, the lessons are there for us to see. The story illustrates how leaders can respond to crises and victims can show behaviors and values that can teach us about disaster response. Finally, it shows us how leadership can operate in the midst of crisis and media can respond positively to not overreact as so often takes place, but to manage for what everyone hopes will be positive outcomes. All of this is true but it ignores the impact of what happens when a country exercises strong management tools to solve a difficult problem while the world watches. Few would dispute that Chile’s positive awareness is much higher today than it was before the mining accident. It is a result of both what the Chileans did and what they said working with modern media and marketing communications as part of the overall management of the crisis. The miners’ rescue won’t change Chile’s ranking on the global competitiveness index but it will open doors in the U.S. and elsewhere for Chilean businesses that never looked at the country before. How long those doors stay open and whether they lead to new business will depend on how well Chile manages from this point forward. This is the fourth installment in a series on Mistakes Countries Make and How They Can Get It Right. There are consultants out there who advise foreign governments to make everything they do perfect for their target markets. They go internal to focus on changing policy, strategy, innovation and investment over a very long period of time. The result is that governments invest their time on getting their house in order and the problem with that is that the people walking by the house have no idea what’s going on inside. It’s simply not a case of building the perfect country so that all the investors come running. There’s no question that real change only takes place when countries change what they do, not just what they say. But in our marketing driven world, it’s not enough to simply make those changes and expect the world to notice. In the 90’s we ran national image development campaigns in the U.S. for both Norway and Chile and saw ample evidence that perceptions were changed through use of marketing tools that often are used for common everyday products. Marketing tools play a key role as long as they represent changes that are real. Years ago, Michael Porter wrote that strategy is only valid if it represents real operations. In other words, you can’t sell the store without knowing the goods are on the shelves. Countries can change policy, strategy, innovation and investment over a very long period but if no one knows about it, export development and FDI will come at a much slower pace than if there is a coordinated marketing campaign that represents the real situation. Too many internal assumptions about what foreign markets think and want. For example, New Yorkers will often talk about garbage in the streets while foreigners exalt the skyline, energy of the city and multiple entertainment options. When Americans return from Chile, they can’t stop talking about the beauty of the Andes and the perfect manners of the people who live there. Chileans on the other hand will talk about smoggy days and can be quite self-critical. It’s human nature. We see things in the mirror everyday that others around us see differently. Countries have to adjust their marketing by what others think. Effective strategy is found at the intersection of internal capabilities and external needs. Failure to conduct sufficient open-ended research to determine what’s really on people’s minds in other countries. It’s not difficult to give thousands of people closed-ended questions with multiple choice responses or agreement scales and then make our own interpretations based on internal assumptions. The problem is that closed-ended questions create bias because they predefine the range of answers. As to agreement scales, what’s the difference between one person’s 3 and another’s 4 and why? Nobody knows but everybody has an opinion. Real perceptions come by asking open-ended questions that begin with “What”, “Why” and “How”. Effective positioning campaigns cannot be conducted without knowing what people really think on an unaided basis. Perfect the model before showing it to the public. There is a lot in this blog about this for good reason. Too many countries invest too much money into defining what they are before going out to the market. What they often find is that the market has changed and their perfected “image” model is no longer relevant. It’s better to move earlier into the market and get feed back on what you’re doing and saying so that you can adjust as you go. Today’s online marketing tools enable incredible capabilities to gather communities of interest and shared needs that will provide feedback and become brand advocates. Nation marketing is now about building relationships through communities, both those that are publicly available and private ones too. Change has to be real and long-term but I don’t know of any entity, that after instituting real change, didn’t benefit from a well-conceived marketing plan.